Shopping for a home loan for the first time can be confusing. We can help every step of the way. What are the requirements for a First-Time Homebuyers Loan? If you've never owned a home or haven't owned a home in the past three years, you are a first-time homebuyer. Also, if HUD declares you're a recovering victim of a catastrophic home loss or natural disaster you are eligible for this loan. 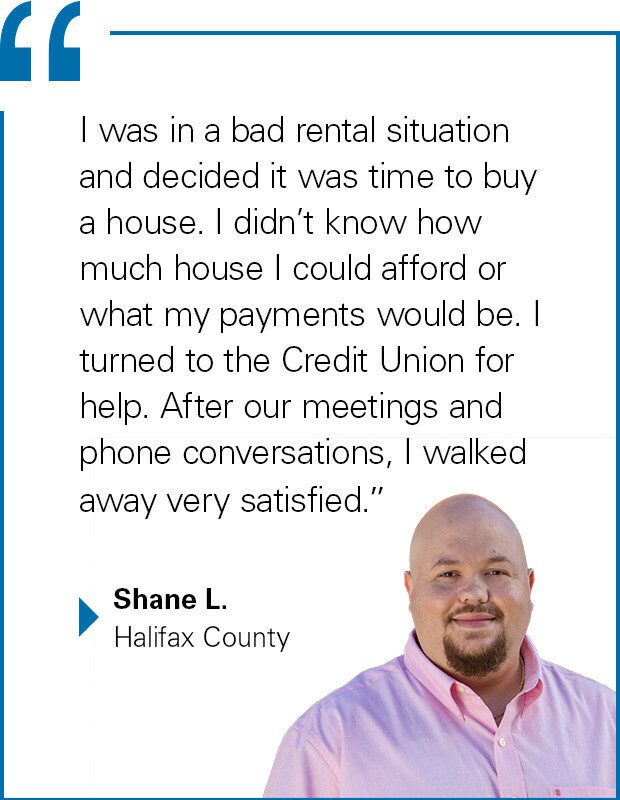 Your Credit Union gives you step-by-step help whether you come in or call us. Our 5-year Adjustable Rate Mortgage (ARM) with a maximum term of 30 years has competitive rates and requires no private mortgage insurance. Financing is available for up to 100 percent of the purchase price with a maximum loan amount of $400,000. Plus, you may be eligible for up to $2,000 in additional financing to help with closing costs. There are no application fees or credit report fees for you to pay. Any property you purchase with an LGFCU mortgage must be in North Carolina, South Carolina, Virginia, Georgia or Tennessee. Use our mortgage calculators if you want to figure out how much home you can afford or if you want to calculate a mortgage payment. The origination fee is 0.75 percent of the loan amount with a cap of $1,500. The initial interest rate for our ARM loans is set by the LGFCU Board of Directors and is subject to change daily. As a first-time homebuyer you may be eligible for special programs and incentives. LGFCU has partnered with the Federal Home Loan Bank of Atlanta (FHLBA) to provide matching funds for down payments and closing costs when qualified buyers get a First-Time Homebuyers ARM Loan from the Credit Union. The FHLBA grant is only available with the First-Time Homebuyers Loan. The program provides grants in the form of forgivable second mortgages in amounts up to $5,000 to assist members with down payment and closing costs. How do I get a first-time homebuyer grant? You must contribute a minimum of $1,000 of your own money toward the down payment and/or closing costs. The FHLBA provides grant funds up to a maximum of $5,000. You do not have to repay these funds if you remain in the home for at least five years. To be eligible for this program, your total gross household income must not exceed 80 percent of the area median income for the county in which the home is being purchased. Call us or visit your local branch for additional information and guidelines about this grant. You can use the FHLBA Grant Program in combination with the Mortgage Credit Certificate offered through the North Carolina Housing Finance Agency. This certificate works best with members buying a first home because it reduces the tax liability on a home purchase. Choose a way to request your First-Time Homebuyers Loan.